Every day, Cindy Fleischner lines up her crew of cuddly canines for breakfast. As the four other dogs eat, Cindy pulls Katy, her 12 year old Shepherd mix aside for a peanut butter treat. Katy is battling lymphoma and this treat hides her daily dose of chemotherapy drugs. Katy is not alone in this war. Canine cancer is one of the leading causes of dog deaths. Of the more than 100 million dogs in North America, about two in four will develop cancer and one in four will die from some form of this dreaded disease. In some purebred dogs, the percentages could be even higher. Adopted from the Denver Dumb Friends League, Katy was no stranger to hospitals. 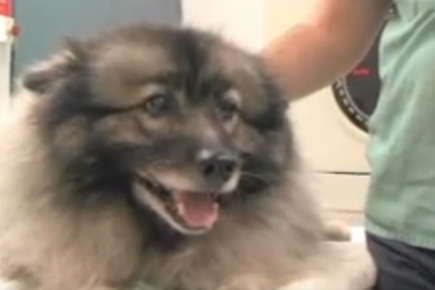 As a licensed Therapy Dog, she spent many hours at a local hospital, bringing comfort and joy to patients.However, Fleishner began to notice that Katy, a normally sweet dog, became distracted and that something was not right. A physical examination found a growing mass on Katy's throat. Further testing and surgery would determine that the lump was thyroid cancer. Fleishner found that the whole process of determining the best course of action was confusing. After surgery, Katy underwent radiation therapy for the thyroid tumor at Colorado State University. She was able to win this battle, but her war against cancer wasn't over yet. Katy was again diagnosed, this time with a lymphoma, requiring more treatments and time with a cancer specialist. Eventually, these treatments saved her life. Fleishner knows she's lucky. In her metropolitan area, she had the choice of visiting a veterinary teaching hospital or a specialty center with a veterinary oncologist. Unfortunately, not all owners are as lucky. Sadly, cancer will claim almost 50 percent of dogs over 10 years old, leaving their owners bewildered and unsure of what to do. And of the almost 9,000 veterinary specialists, less than 200 specialize in veterinary oncology. A new collaboration, however, may help provide some answers - and options. The Morris Animal Foundation, www.morrisanimalfoundation.org has launched the Canine Cancer Campaign in an attempt to stop cancer in our pets with a goal to cure this deadly disease within the next 10 to 20 years. Another immediate priority of the foundation is collaborating with cancer specialists ensuring pet owners have access to treatment options and advice. A new service through Oncura Partners, a well-known oncology specialist group is paving the way for owners to receive a free consultation through their veterinarian. Additionally, the MAF Canine Cancer Campaign brings together research scientists, industry leaders and 44 million dog-owning households throughout the nation in an effort to eradicate canine cancer. Already, multiple scientific endeavors are working towards this end. A canine cancer tissue bank has been created due to a generous $1.1 million donation from Pfizer Animal Health. The Golden Retriever Foundation has promised $500,000 towards research for early detection. This will be money well spent since approximately 60% of Golden Retrievers die from cancer. Fleishner happily reports Katy is doing well with her lymphoma treatments, and her sweet, good-natured personality has returned. Beyond helping our dogs with new innovative therapies, the Canine Cancer Campaign offers benefits for us as well. Many breakthroughs happening in this research will help fuel further prevention, treatment and even cures for human cancers. Remember, there is hope for dogs and their owners - despite a cancer diagnosis. Like Katy, pets can tolerate cancer treatments. Your veterinarian will work with you, local specialists and national resources to ensure your pet receives the best outcome possible. To learn more about the Canine Cancer Campaign, visit www.curecaninecancer.org.